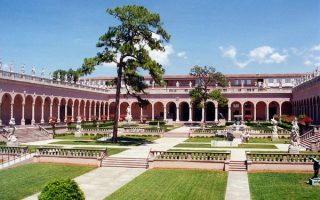 Sarasota is known for its great weather, sandy beaches, recreation, cultural amenities, and Italianate architecture influenced by Ringling’s Cà d’Zan. 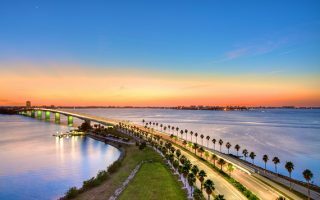 Our guide to running in Sarasota highlights the beauty of Sarasota Bay and the barrier islands, several larger parks on the outskirts of the city, and a couple of routes in lovely Venice, which is 20 miles south. The running highlight in Sarasota is the Ringling Causeway, with its spectacular views, and a nice jaunt to Lido Key. There’s great beach running on Siesta Key Beach. For water views and spectacular homes, we love Casey Key and Bay Shore Rd. For a quick 5k, run around the rowing lake at Nathan Benderson Park. 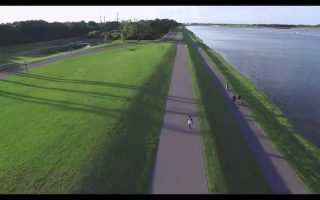 For hills, the incline of the Ringling Causeway will get the heart rate going, or head to the unique Celery Fields. 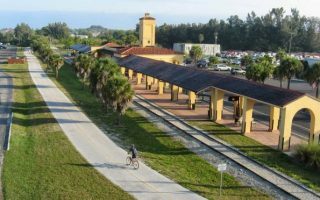 Just south of Sarasota, there’s the 11-mile Legacy Trail bike path, which runs into the 5-mile Venetian waterway trail at its southern end. Or, enjoy 15 miles of trails at Oscar Scherer State Park. 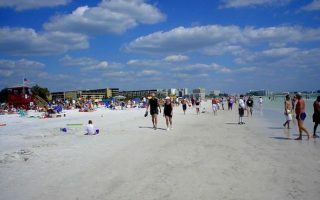 Sarasota features Florida’s famous sunny, warm weather, but it does get hot and humid in summer. There is a limited bus system in Sarasota and access to some good running right downtown, but anywhere outside that generally requires a car. There's some pleasant running downtown. The area south of Fruitville Rd. to U.S. 41 has some pleasant, shaded side streets with nice homes. Main St. is fun, down the the water, as is the area just south of Fruitville to the waterside Arts Center. Former celery fields are now a combination water collection zone, restored wetlands area, birding spot, and recreation area. ~4 miles of perimeter trails around marshlands, ponds, canals, edged by oaks, willows, and pines. Hill running on Observation Hill. 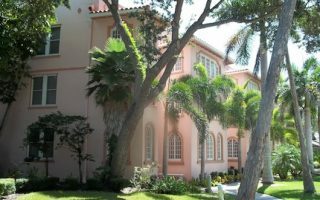 Near the Ringling Museum and the airport, this is an opportunity to run on some pleasant roads, incorporating some interesting Sarasota sites and lovely homes. Bay Shore Rd. is the anchor to this run from the New College of Florida to Indian Beach. Pleasant, low traffic road, with good views to the Gulf of Mexico, and some spectacular waterside homes. Straight shot on Casey Key Rd., up to 6 miles one-way from the beach pavilion. It's also possible to run on the beach here. 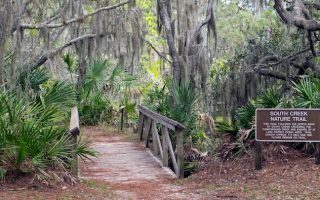 1,200 acre state park between Venice and Sarasota, with 15 miles of trails. 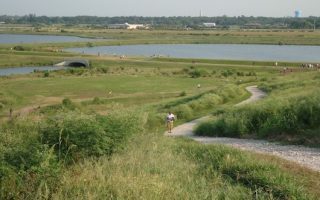 Combination of paved bike trails and more rugged hiking trails. Nice spot for some shaded running. Popular kayaking & birding spot, and a swimmable lake! 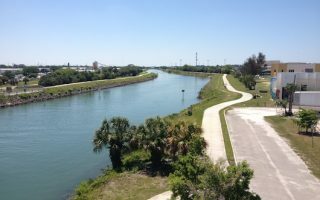 A lovely paved trail that runs along both sides of the Intracoastal Waterway, from historic downtown Venice, south to the Shamrock Park Nature Center and Caspersen Beach. Can do a great a 10-mile loop, with good views of the water. A 10.8 mile former rail line, now a paved recreation trail running from Venice, north toward Sarasota. Some shaded, foliated sections, pastureland, streams and rivers, and some more populated sections. Intersects with Oscar Sherer State Park at halfway point. Named one of the best beaches in the United States, it's also great for running, with white, firm sand -- especially at low tide. The overall beach is 8 miles, but the best continuous section is ~3 miles south from Siesta Village. Mainly a beach run. 600 acre public park that's mainly a rowing facility. But there's a nice path around the lake that makes for a good 5k+ loop. Eastern side of the lake has a dedicated path along a fairly busy road, while the western side is more bucolic. 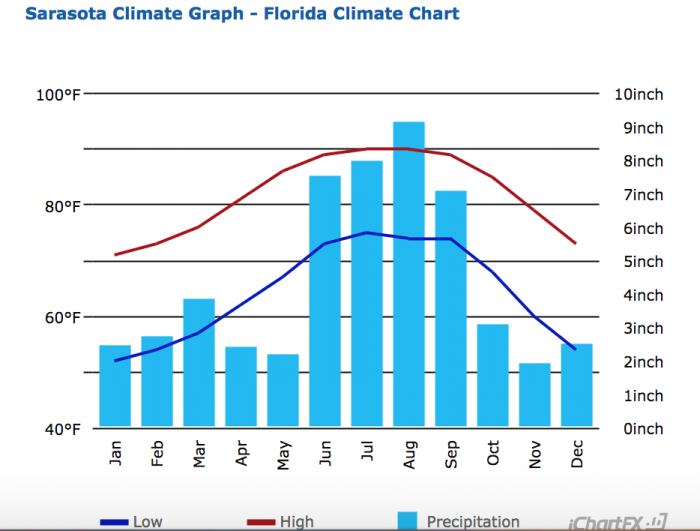 Sarasota has weather typical of southwestern Florida. It’s warm and sunny all year. The months from November through April are delightful for running, with average highs in the 70s (21-25C) and nightly temps in the low 50s (11C-13C) in winter. It’s also less humid and rainy. Summers are hot, wet, and humid. Average July high temperatures from May-October are in the 85-90F range, with high levels of humidity and near daily thunderstorms. Plan accordingly, re. hydration and possible deluges. Running in the early morning is best chance to avoid getting caught in a T-storm. 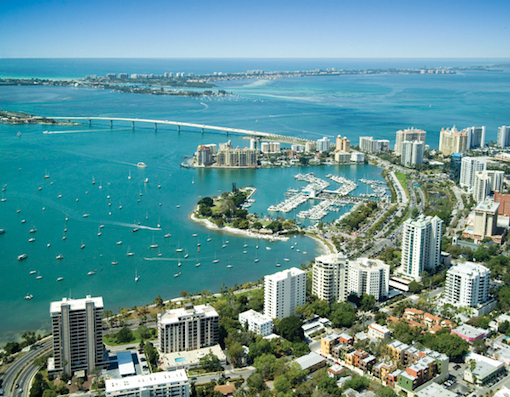 Sarasota is a popular tourist destination, so there are lots of hotels for all budget levels. If you stay downtown, there’s good access to good downtown running, the Ringling Causeway/Bridge, and Lido Key. There are also lots of hotels at Siesta Beach. Just north of downtown, there are nice hotels near the Arts district, which provides access to the Indian Beach/Bay Shore Rd. run. There are hotels at the northern and southern ends of Casey Key Rd. Venice is another option. Staying in historic downtown Venice provides good access to running on Venice Beach, the Venetian Waterway Park trail, and the southern end of the 11-mile Legacy Trail. There are several great running stores in Sarasota. We especially thank the folks at Fit2Run for their help with this guide! Fit2Run. Two locations in Sarasota, one on Main St. and University Town Center. Group Runs: See calendar. Fleet Feet. Also located downtown. Group Runs: Thursdays 6pm. Also other events. See calendar. New Balance. Two locations in Sarasota. Group Runs: See calendar. Another great running event calendar.